The global medical fraternity has been exploring various alternative approaches to cancer treatment. 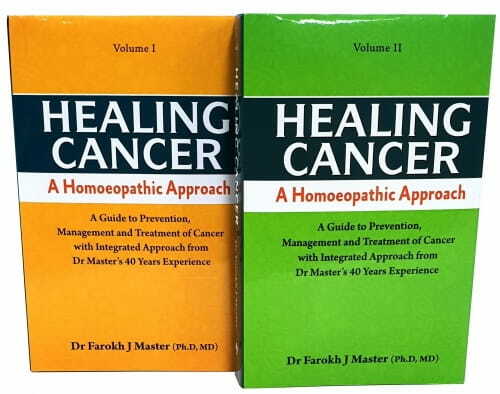 However, this exceptional book, “Healing Cancer: A Homoeopathic Approach” by Dr Farokh J Master, does not endorse a focused methodology, but it paves the way to a holistic homoeopath’s approach. For the last 40 years, the author has been utilising this approach which is in line with the Master Hahnemann’s teachings, where he gives importance to constitution, miasms, susceptibility, and most important, palliation. It is a complete handbook, a ready reference providing authentic information on every aspect of malignant diseases. It covers the cancer related topics beginning from cancer archetype, clinical information on diagnosis, prevention, conventional treatment, homoeopathic aspects, therapeutics, polycrest remedies, rare remedies, Indian remedies, wisdom from the repertory, naturopathic and dietary suggestions, Iscador therapy, and social aspects of cancer to the latest researches in the field of cancer. Given the efforts put in by the author in writing this vast book, encompassing decades of clinical experience, this is indeed a valuable addition to the homoeopathic literature. In addition to homoeopaths, this book will indeed be useful for medical doctors of other modalities of therapeutics who also wish to explore a holistic approach to cancer patients since this book is the outcome of author’s successful efforts in introducing and integrating homoeopathy to the mainstream cancer treatment.